(l-r) Mads Mikkelsen stars as Overgård in ARCTIC. ©Bleecker Street. CR: Helen Sloan / Bleecker Street. HOLLYWOOD—Mads Mikkelsen plays a man stranded near the North Pole following a small plane crash in the survival drama “Arctic.” Alone for weeks, he fights daily against the unforgiving elements and a lurking polar bear. His precarious situation, in which he is both physically and emotionally challenged awaiting a rescue that may never come, is further complicated when another human enters the picture. 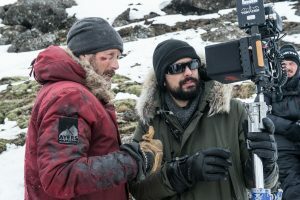 The film was shot over 30 days, occasionally interrupted by blizzards, on location in Iceland by Brazilian musician/director Joe Penna (“Turning Point,” “Beyond”), who co-wrote the screenplay with frequent collaborator Ryan Morrison. “Arctic” opens in limited release in theaters Feb. 1. During a phone interview, Mikkelsen and Penna spoke about making the film under grueling weather conditions, and which centers almost exclusively on Mikkelsen’s character, a plane-crash survivor named Overgard. Q: Joe, what made you want to make a movie about a man stranded in the Arctic? Penna: It definitely was an experience. I’m a guy from Brazil who lives in Los Angeles. Initially, I wrote the story to take place on a Martian desert, where he was terraforming Mars. This guy crash-lands far from a human settlement. We wrote the entire script and sent it to our agents. They said, “There’s this other film called ‘The Martian’ that will be coming out soon so maybe you should change it now.” So, we decided to move it to the most desolate place here on Earth, the Arctic. Q: Mads, what was the appeal to you? You see the title, “Arctic,” so you kind of know what you’re in for, right? Mikkelsen: Yeah, I had a hunch. Initially, it was the story but, later on, it was Joe. I loved everything I read on that page, and then when I turned it, I loved the next page, and so on. I thought it was pure and honest. It avoided falling into the traps of going down memory lane and flashbacks that, to me, would have ruined the experience. So, I thought it was a pure, beautiful and emotional journey. When I heard why Joe wanted to do with it I was sold, and I said, “yes” right away on the phone. Mikkelsen: It wasn’t one moment; it was the entire time. It was extremely brutal. There were plenty of situations where I wished either that I was 22 years old or that I was back home. But it’s often like that when you write a script, come up with a great idea, and you’re high-fiving each other, and then when you get there (to set), at the point where you going to actually shoot it, that you realize this is going to take a toll, and it did every single day. Q: Because there is so little dialogue, what did the script look like? Penna: The script was very often confused for a short film because there is so little dialogue. We broke a lot of screenwriting rules—being overly descriptive about certain things, putting little poems in there, doing a little haiku, and simply having pages in it that were different from what you might see on a usual feature-film screenplay. But there was more dialogue in there initially—perhaps some dialogue that we knew we wanted to cut—because there were some things that could work visually. How many times can I say in the script, “Mads looks at things?” So, we touched on that a lot, actually. Mikkelsen: The stuff we cut out mostly was there were a few information lines that he came up with talking to himself. We were both in love with the fact that he talked to himself but we agreed that it should be rational what he said and we didn’t want it to contain information. We wanted it to be a way for him to stay sane. So, whatever information we needed in the film, we knew we had to put in in a different way. That was basically what we cut out. Q: Overgard’s post-crash life is ordered around the alarm of his wristwatch. When did the sound of the watch alarm come into the script? Penna: That was in there from the Mars version of the script, actually. We gave him a solar-powered automatic watch in that. In the script, there may be 20-30 instances of where we wrote, “BEEP! BEEP! BEEP! BEEP!” in order to keep that momentum going. We spoke to a lot of Arctic survivalists that told us that it is utterly important to keep a routine in order to survive, so that was very important from the very beginning. Q: Mads, what did you learn from speaking with the survivalists? Mikkelsen: Joe did all the talking when he was developing the story with Ryan. We deliberately just wanted me to be dumped up there in the Arctic, and not having a clue what to do about surviving, because that’s basically what happens to the character. He doesn’t have this plan; he’s just on his way home for a nice cup of coffee, and he ends up there. So, we wanted me to go through that same journey, and be as smart as I could. Joe, obviously, knew a little more about survival but my character didn’t need to know. He would have to learn as he was going. Q: Overgard isn’t a MacGyver, where he can build a functioning plane out of spare parts but he is able to salvage some materials to make makeshift tools, like the fishing alert device. Mikkelsen: I’ve never been a boy scout or ever camped but I probably would do the exact same thing my character does. If there was a lake and I had some kind of wire, I would definitely try to make a fishing line. He’s capable, but I don’t think he’s more capable than you or I. That was the whole idea. We didn’t want the audience to scream at him, “Amateur! Do this instead,” bur we didn’t want him to be too smart either. He did the basic things to survive that you or I would do. Q: For each of you—and it may not have been the same day—what was the most difficult day of the shoot? Penna: For me, it was the half day of pickups that we got from Aggie, our 22-year-old polar bear. We already had shot everything with Mads. Trying to get a polar bear, who’s half-trained, to get continuity to match what we already shot wasn’t ideal for me, especially when the trainer didn’t allow me to speak to (the bear) directly. That was very difficult but we ended up getting exactly what we needed for that scene to work. Q: The scene where you’re trying to pull the sled with the injured woman, played by Maria Thelma Smaradottir, up the snowy mountain face and it keeps sliding backwards is a visceral one for the audience. Q: Speaking of Maria, how was it working opposite someone with whom cannot communicate with you? Mikkelsen: It was the best day of shooting when she entered the film because, finally, I had someone to bounce off, someone to communicate with. Whether or not she was communicating a lot, it was still someone. I wasn’t throwing the ball out in the open space. It was coming back. For me, that was the best day of the shooting. Penna: Casting-wise, it was great speaking to her because she didn’t see it as a throw-away role that would be simple or easy. She saw it as a challenge because she need to portray a person who’s going from relative health to worse, and up and down. So, we had to create a way to speak about that effectively. When we did, when we met her, we knew she was the one for us. Q: Mads, what is your takeaway from this film? Mikkelsen: What we’re trying to say is there is an enormous difference between surviving and being alive. Overgard starts coming back to life when the woman enters the film. He’s always telling her, “It’s OK. You’re not alone.” That’s the mantra of the film. It’s very difficult to be human and be alone.